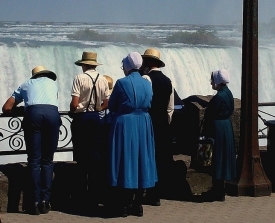 Canada is home to approximately 5,000 Amish, and is the only Amish location outside the US. Ontario is the only province in Canada where Amish live. Amish have a long history in Canada, with the oldest settlement at Milverton dating to the 1820s. If you’ve ever read the Amish periodical Family Life, you should know Aylmer, the home of Pathway Publishers, who put out Family Life and a number of other publications. You can read more in the Canada Amish guide, just completed. With Canada our last “state guide” entry–the Amish State Guide resource is now finished (well, that said there could be one more state to add on the horizon…). Related: a guide to Amish furniture in Ontario. The St. Jacobs area of Ontario is also home to a large population of Old Order Mennonites, and there are other Old Order groups of Mennonites in Canada. Ontario has excellent farm land, and the southern regions are temperate, similar in climate to Pennsylvania. The land there is now too expensive, I suppose, to be of much use to new farmers. In the last few years some Old Order Mennonites have moved from Ontario to the Gladstone area in Manitoba. I get all 3 Pathway Publications and am particularly fond of “Family Life” but enjoy them all and have learned a lot about the Amish from reading them. I also have learned a lot from this web site and am grateful to you, Erik, for having it. I appreciate that Joan, and thanks for visiting it! I much recommend Pathway’s publications. Good reading even if you’re not Amish. Thank you for writing this, Erik. I appreciate it. I like the state guide for Canada/Ontario, but I won’t nitpick about the state thing, no James Madison jokes on my part…. I have been to Aylmer, lovely spot. I think I saw the property that Pathway is published from when I was in the area a decade or so ago. There was a hand painted sign that read “Pathway” and as I recall not much more, it lead into a farm. Thanks though and glad you enjoyed it! Mark; I can tell you its not Upper or Lower Canada. A new state…hmmm maybe a contest to guess which one it is? I would take a stab Oregon. I visited Elmira last spring, nice community but unfortunately I was there on a Sunday, so all the OOM businesses were closed. I’ve been aware of the Mennonite communities north of K-W forever, but wasn’t aware of the Amish settlement in the Milverton area. I love traveling through that part of the province. Hope to make some Amish contacts in the future. There are also Mennonite farmers near Massey (west of Sudbury), though I wonder how the farming is up there because there is a lot of rock, and even the wild vegetation looks noticeably sparser. The farmland in southern Ontario is definitely more productive. A couple years ago we went on a family vacation to Canada. The day we began our trip home we stopped on the American side of Niagara Falls and had lunch. As we left the restaurant and were crossing the street I heard my husband saying, “Look! Look!” and there was a whole group of Amish young people sitting on benches and milling around (my husband does not have the interest in the Amish like I do, but he doesn’t want me to miss a thing!). My question is how are they managing with the prairie weather… Perphaps Ordnug rules on dress would have to change in some cases I imagine so that frostbite would not be too big a problem. Southern Ontario can get cold, but I know from experience that Southern Manitoba is one of the coldest places to live on earth. Anisa I had a look at the article–it’s interesting, though it’s also over 5 years old and there doesn’t seem to be much else out there on Amish living in Manitoba. I had not heard of this group’s story, though a couple things are possible: in some cases what have been termed “para-Amish” or more coloquially “out-of-order Amish” set up communities in some ways similar to Amish but not accepted as officially Amish by other communities, or what is probably more likely here, it could be another plain groups such as a Mennonite group mistaken for Amish. Also, David Luthy, an Ontario Amishman who compiles a comprehensive list of Amish settlements every five years, did not include anyone from Manitoba in 2008, and if anyone would know, he would. The previous year’s Amish Almanac (2007) also does not list any group from Manitoba. You present an interesting question though, as to how an Amish group would do in those conditions. Seems like you’d need a pretty good heater in the buggy. The people who have moved into the Gladstone/Plumas area of Manitoba do not go by the title of Amish. They ask to be called Horse and Buggy Menonites. They farm with horses and no electricity and dress in the Amish style. They seem to be expanding and buying more farm land as well as selling RTM buildings, furniture and also have a welding shop. There are Horse and Buggy Mennonites in Gladstone MB . The highways office has posted an 8km stretch of highway west of the town a Horse and Buggy caution. I have just finished reading RUMSPRINGA – to be or not to be amish by Tom Shachtman — very interesting. I have seen old order people waiting for trains at union station to take them to the i assume, the k-w area. I used to see the old order people coming into Simcoe, Norfolk Ontario to the big box stores for their grocery shopping. Simcoe is about 25 miles away from Aylmer, Ontario. There is a Quaker community in Sparta, Ontario. Aylmer was in the news a few years ago when members of the church of god were charged with child abuse for spanking their children. The Amish/Mennonite people are indeed buying farms in northern Ontario beginning in the Almoguin Highlands (Powassan where they bought the Anderson farm, Callendar where the Dionne quintuplets AND Michael J Fox were born). the Algoma farming area is quite rich, and seems to run north from Powassan up through North Bay and north west to the Sudbury area, plus north east towards Timmins and Cochrane, Ontario close to the Ottawa River Valley. My niece-in-law is from a Mennonite background in Tavistock, Ontario but her family is pentecostal now. I have a question, not related to the above. I do not know who to contact, maybe you can help. We have two horse drawn mowers for sale We live close to the 401 and 416 junction. Not sure which communities are close to us or who use these machines now. Also is there a for sale page in you magazines? I used to live in Ontario but moved to New Brunswick 3 years ago. There are a lot of Amish in Maine, and now there are houses popping up in New Brunswick where the Amish are living. Every time we drive by them there is more done to the houses and there are all kinds of out buildings. There are other Amish living in other houses around here too.